Ellen Sollod is an interdisciplinary artist based in the Pacific Northwest. 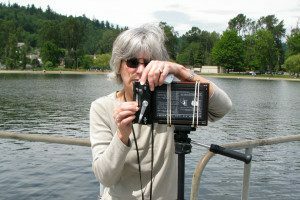 Her practice includes large scale, site-specific public art, multimedia temporary installations, artist books, photography and photo-based works. Born in NY and raised in South Carolina, she moved successively north and west, finally alighting in Seattle, where she has made her home for the last 25 years. Ellen has a BA in art history from the University of North Carolina, Chapel Hill and a MA from the Institute for Urban Studies, University of Maryland. She served as Assistant Director of the Dance Program of the National Endowment for the Arts, Executive Director of the Colorado Council on the Arts and Humanities and the Seattle Arts Commission. Since 1993, she has devoted herself to her public and studio practice, maintaining an activist role on behalf of the arts in civic life. She recently served as Vice Chair of the Seattle Design Commission and as a member of the Seattle Office of Arts and Culture Public Art Advisory Committee. Ellen has traveled extensively to Europe, SE Asia, Africa and Latin America. All of this has influenced her work. Major public commissions include Seattle’s Mercer Corridor, Brightwater Wastewater Treatment Plant, San Jose Light Rail, Olympia, WA Gateway Corridor, Bellingham, WA Arts District, Pier Park (Portland, OR), Morrill Meadows Park (Kent, WA), Harborview Medical Center (Seattle, WA). Her bookworks are included in such collections as Yale University Center for the Book, NYPL Spencer Collection, University of Washington Special Collections and the National Museum of Women in the Arts. A complete resume can be viewed here.